Louisville Drone Academy inspires children and young adults through STEM education, to secure productive and fulfilling careers. Our first camp is scheduled Friday, June 28th - Saturday, June 29th, 2019. Location: Launch Louisville, 816 E. Broadway. Please sign up below and we will respond promptly! *Additional summer camp dates and locations will be posted here soon. If you are interested in signing up for lessons or a different date, please ‘Request More Info’ below. This camp will include drone repair, drone programming, creating autonomous flight missions, 3D modeling, utilizing thermal images, and producing professional deliverables. This camp is packed with exciting exercises, including drone programming (Python), flying through obstacle courses, and flight simulators. Mini-drone building courses are also available where students will construct their own drone to take home at the end of camp. Our curriculum is designed to spark an interest and passion in STEM related fields to help motivate students into thinking about using drones professionally to create a sustainable career. 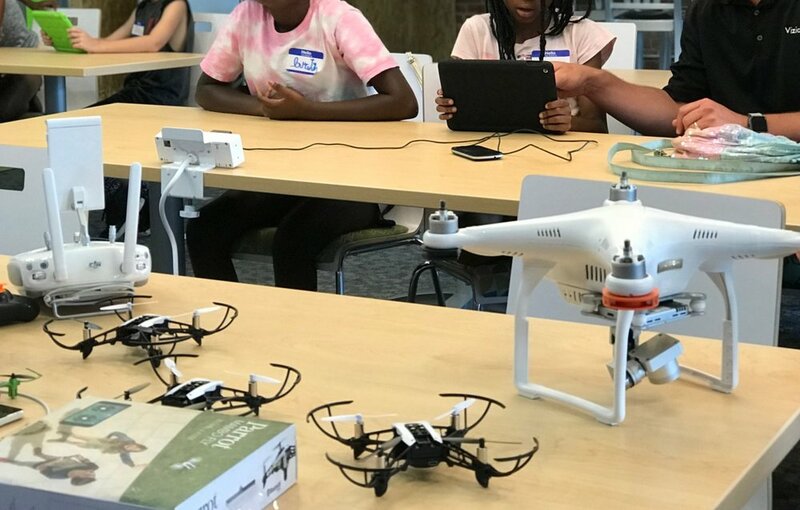 These camps are typically 2 half days up to 5 days, where participants will learn FAA flight basics and safety, drone programming, drone repair, and advanced flight maneuvers. Activities range from search and rescue missions, roof inspections, thermal imaging, 3D modeling, and drone racing. We encourage our students to push the limits of what is possible while uncovering passion, building confidence, and most importantly, working together.